A few uncommon events could also occur. Many of these would be caused by a chain reaction from another disaster or SHTF event. Severity of weather based on temperature is affected by the actual temperature, weather conditions such as wind and precipitation, and the longevity of the event. Prolonged blizzards with below freezing temperatures can be deadly, even with modern conveniences. They can prevent travel and first responders from reaching those in need. Power outages instantly become a matter of life and death. Any combination of emergency or disaster is immediately severe and life threatening. On the other hand, places that are used to cold weather easily weather small snow storms. The severity of these situations is minimal. Yes. A weather pattern with extreme cold weather and/or precipitation that lasts an unusually long time could cause TEOTWAWKI. This could be a modern day ice age, or the after effect of another risk such as nuclear winter caused by coordinated nuclear attacks. While the probability of extreme cold causing TEOTWAWKI is very low, it increases slightly with human weather tampering. 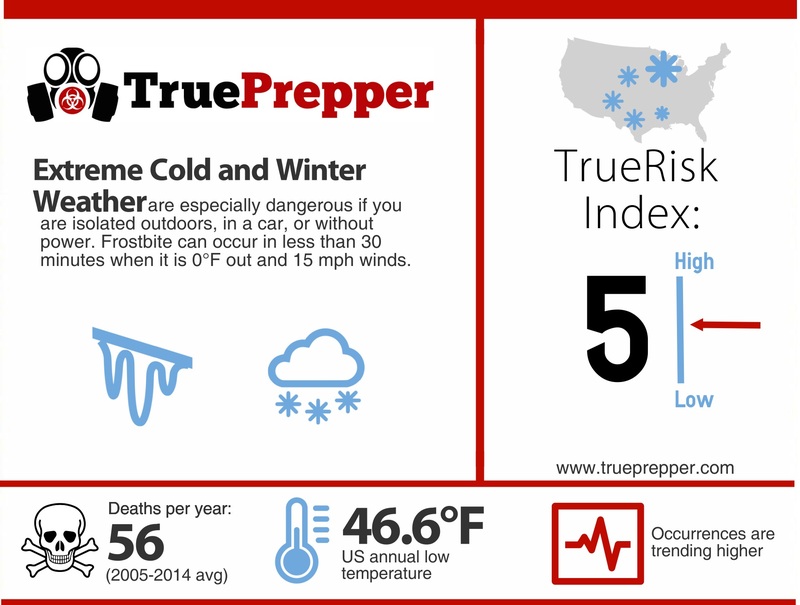 Extreme cold rings in as a 5 on the TrueRisk index. This threat level is dependent on your location, for the most part. Geographically, higher altitude areas and places further from the equator are more susceptible to extremely cold weather. This also usually means that these places are more prepared for it, which makes cold weather particularly dangerous for tropical areas if they were to experience them. The balance of high impact, low probability in hotter areas and low impact, high probability in colder areas lends the idea that everyone should be prepared for cold weather events on a basic level. To determine your risk level, check out your geographic weather patterns and see if you have any redundant heating systems available. There is usually plenty of notice prior to an event with extreme cold. Many others respond to this notice by running to the store and stocking up on “essentials.” Hopefully, you already have food and water storage and plan to ride out any event comfortably. Getting home and surviving at home or when stranded should be the goals of your kits. Set yourself up for survival by stocking plenty of food and water. Keeping additional clothing in your car kit and get home bag is a good consideration as well. Attempting movement is not advised during extremely cold weather patterns, so bugging in is usually the best option. If you are trapped away from your home, you may need to find refuge somewhere closer. There is usually very little to do during a cold weather event. Hunker down and stay warm. Be prepared for a power outage and/or problems with heating systems. Deal with problems as they arise and pass the time with rest and recreation. Keep spirits up as you ride out the storm. You may need to venture outside to clear precipitation off the roof if it looks as if it could cause problems. 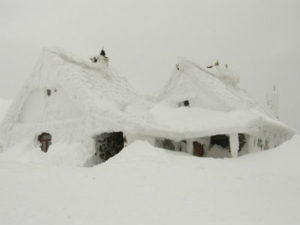 Too much snow buildup could cause a roof collapse, especially on roofs with a low pitch. In Buffalo, New York and Montreal, Quebec they even have building codes with a minimum pitch so heavy snowfall does not cause weight issues. Trees can also be weighed down by freezing rain and precipitation, so know falling trees and limbs could be an issue if trees are close to your house. Clearing snow drifts may be necessary after blizzards and snow storms. If you had any damage to your home, patch holes with a tarp and call an insurance adjuster if needed. If your heating system struggled to keep up, you may want to have it looked at. Be sure to replenish any supplies you may have used to get through the weather and conduct an inventory. Evaluate your emergency plans and change anything that could help for future storms.